Which Interactive Flat Screen Should I Buy? Buying an interactive flat screen for you or your school is a big decision to make and we want to help you make an informed decision. Having a little bit of insight into what to look out for when trying to decide which flat screen to buy can make a big difference, read on to find out what you should know about buying flat screens. There are many different interactive flatscreen options on the market. We will cover all the following points individually in blogs over the coming months but for now here are some ‘what to look for’ guidelines when deciding how to spend your hard earned money. 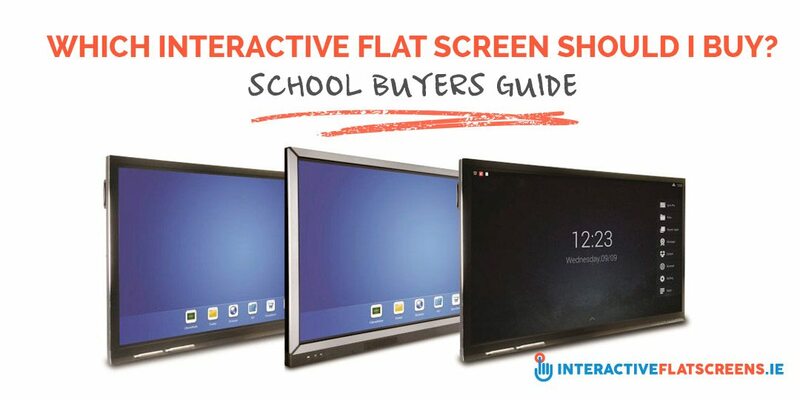 Whatever brand of interactive flatscreen you decide to purchase, make sure that the brand in question has a proven track record in supplying schools and it is a product designed to be robust enough to handle the tough rigors of the classroom. Whilst new to market products will always have some appeal whether ‘super low price’ or ‘lifetime warranty’ they are simply no good to anyone if they are not fit for purpose. As obvious as it sounds. Most suppliers will offer a range of interactive flat screen sizes to suit different rooms and different applications. Make sure you choose the size that fits your classroom and needs and that the vendor has all the sizes you need. Some interactive flat screens come with a 3 year warranty. Most are now offering 5 year. Be wary of 5 year warranties which are made up of 3 years onsite and a further 2 year Return to base. You do not want to be in year 4 and finding yourself responsible for taking a 100kg flatscreen off the wall and shipping it to a company in the UK to be fixed. Oh, and then collecting it when it’s fixed……. enough said! There is a difference between ‘banging it up on the wall’ and a ‘professional AV Installation’. A good install should be neat and tidy. Cabled for computer, (VGA & HDMI), audio, USB, mains & a professional termination plate supplied. You should not notice the installation cabling or termination when you enter the room. It is worth checking this out in advance of ordering as the promise of FREE installation may be the one thing you regret in time. Is training an option? Most companies charge for training. This is fair. There is a difference between a quick 5 minute demo after installation and scheduled and professional flat screen training. Find out exactly what you will get. Your interactive flatscreen should be at least full HD 1920 x 1080 resolution. Anything less, don’t go there. Does the device support multi touch? A minimum of 6 touches is recommended. By far the best single feature I have seen on an interactive flat screen is an on-board android platform. This allows you to operate the system without connecting it to your laptop. You can whiteboard, annotate, browse the web, play a video, plug in a USB and run word, PowerPoint as well as open PDFs, videos etc. This really is a revolutionary development. Can you get an onsite demonstration or even a trial of an interactive flatscreen? Always good to try it out before committing. Ask to speak to some existing customers who have selected the product you are considering and see how they are getting on. Is there a case study or some testimonials available? Speaking to existing users will give you peace of mind or answer practical questions you want to ask. 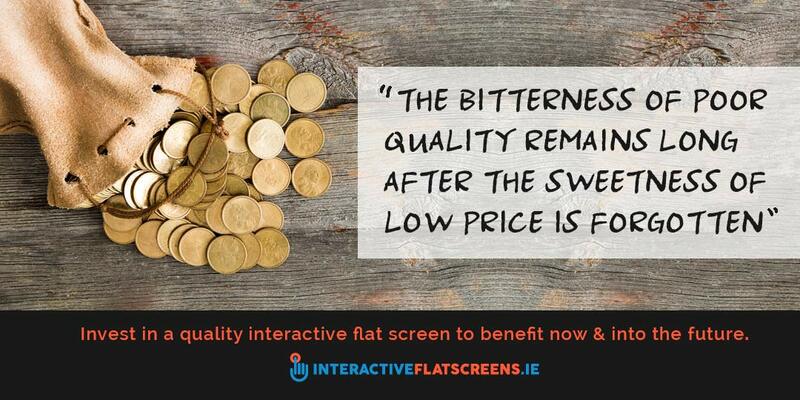 This old saying holds particularly true when it comes to interactive flat screens. Projection technology has advanced a lot over the years and making a sound investment in an interactive flat screen now will allow you to reap the benefits now and well into the future. Do you need any assistance with anything to do with interactive flat screen Displays? If so call us on +353 01 4660515, email me directly at ivan@audiovisual.ie or contact us online.